Nancarrow Farm might be located in the heart of Cornwall – just four miles from Truro – but you wouldn’t know it. Flanked by mile upon mile of lush meadows and rolling countryside, the 100-acre organic farm is a tranquil, timeless spot, where life falls into step with the rhythm of nature. Mature trees and carpets of wild flowers sit alongside characterful farm buildings and an orchard bursting with blossom in the spring. The Mewton family have farmed here for nine generations and, throughout their long attachment to the land, have maintained the same farming principles, creating an environment in which their animals thrive and, in turn, producing exceptional quality beef and lamb. They have taken the same approach to their refurbishment of the three large barns, which now house wedding celebrations, and, indeed, their approach to the weddings themselves: with care, professionalism – and a lot of love. The lovingly renovated Grade II listed mill house, the old piggeries and a former milking parlour now make a charmingly rustic wedding venue; each space has been carefully designed to host events with both logistics and aesthetics in mind – making for a versatile and beautiful blank canvas. The Event Barn, for example, sits at the heart of the farm, its huge windows overlooking the historic millpond and flooding the space with natural light. With its high, vaulted ceilings and exposed oak beams, it is a sublime setting for a ceremony. It also doubles as a perfect reception venue: the simple, rustic interiors allow couples to style the space according to their vision, whether it’s a chic, pared back look or a full-blown stylistic affair. For a romantic al fresco ceremony, couples can take their vows in the linhay overlooking the pretty courtyard. 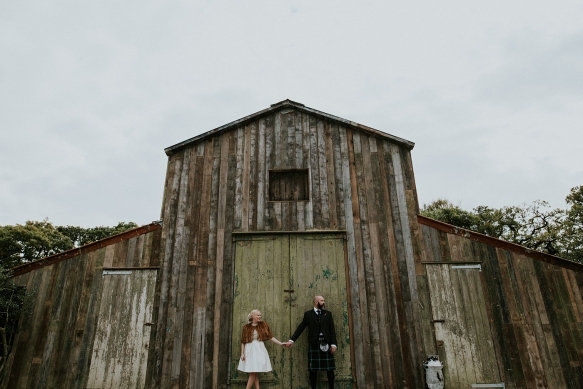 Meanwhile, the latest addition is the stunning, Rusty Barn - a restoration of Nancarrow's old original 1919 hay barn into a gorgeous civil ceremony space, offering couples even more choice at the already-spellbinding setting. Seasonal, locally sourced produce is, naturally, a speciality at Nancarrow Farm and the professional team at the farm kitchen – headed by Ben Quinn, formerly of Fifteen Cornwall – relish designing a feast around each couple’s tastes; think hearty home-cooked classics, chargrilled meats and seafood fresh from the fire pit, and sharing platters of flavoursome salads and roasted vegetables. With accommodation for up to 30 guests, there’s no need to leave this enchanting place after the evening shenanigans. A series of en-suite bedrooms have been rustically styled in the Grade II listed courtyard and four tipis are nestled in the orchard for those who fancy savouring this serene and oh-so special spot under canvas.